When loading has been continued until the stress distribution is as in Fig. 3.3(c) (assumed), the beam with collapse. The moment required to produce this fully plastic state can be obtained from eqn. (3.2), since d is then zero, i.e. This is the moment therefore which produces a plastic hinge in a rectangular-section beam. Thus rectangular-sectioned beams can carry 50% additional moment to that which is required to produce initial yielding at the edge of the beam section before a fully plastic hinge is formed. (It will be shown later that even greater strength is available beyond this stage depending on the support conditions used.) It must always be remembered, however, that should the stresses exceed the yield at any time during service there will be some associated permanent set or deflection when load is removed, and consideration should be given to whether or not this is acceptable. Bearing in mind, however, that normal design office practice involves the use of a safety factor to take account of abnormalities of loading, it should be evident that even at this stage considerable advantages are obtained by application of this factor to the fully plastic condition rather than the limiting elastic case. 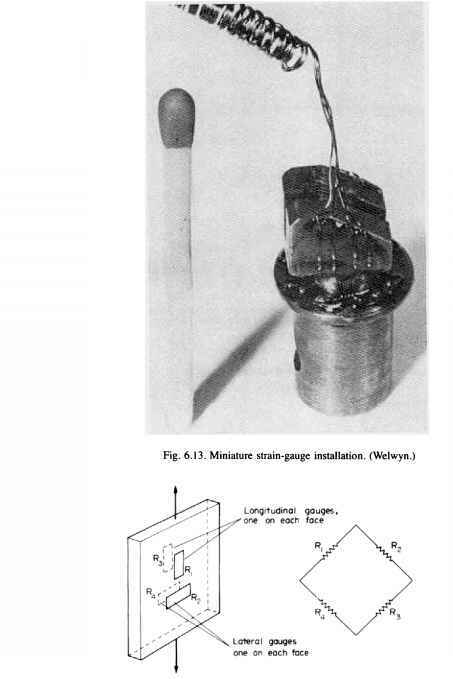 It is then possible to arrange for all normal loading situations to be associated with elastic stresses in the beam, the additional strength in the partially plastic condition being used as the safety margin to take account of unexpected load increases. 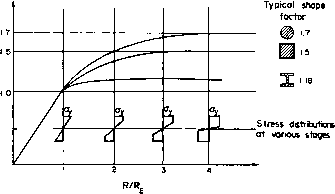 Figure 3.4 shows the way in which moments build up with increasing depth or penetration of yielding and associated radius of curvature as the beam bends. Fig. 3.4. Variation of moment of resistance of beams of various cross-section with depth of plastic penetration and associated radius of curvature. Here the moment M carried by the beam at any particular stage and its associated radius of curvature R are considered as ratios of the values at the maximum elastic or initial yield condition. It will be noticed that at large curvature ratios, i.e. high plastic penetrations, the values of M/Me approach the shape factor of the sections indicated, e.g. 1.5 for the rectangular section. Shape factors of other symmetrical sections such as the I-section beam are found as follows (Fig. 3.5). Fig. 3.5. Plastic bending of symmetrical (I-section) beam. T ~ y with y the maximum distance from the N.A. (the axis of symmetry passing through the centroid) to an outside fibre and a = ay, the yield stress. Then, in the fully plastic condition, the stress will be uniform across the section at ay and the section can be divided into any convenient number of rectangles of area A and centroid distance h from the neutral axis. MFP = ^~^(oyA)h The shape factor Mfp/Me can then be determined. When the B.M. applied to an I-section beam is just sufficient to initiate yielding in the extreme fibres, the stress distribution is as shown in Fig. 3.5(a) and the value of the moment is obtained from the simple bending theory by subtraction of values for convenient rectangles.